Aquarium water quality determines the health of aquatic world in which our fish live. Making sure aquarium water quality stays within the range of healthy parameters is not really difficult. It just takes a little bit of understanding, planning, patience, and some work. For many aquarium hobbyists, before water goes in the tank it starts out as tap water. Other sources of aquarium water may include well water, water run through a reverse osmosis process, or water run through a deionization process. These other sources present challenges that may be beyond the experience of the beginning hobbyist. So for the purposes of thinking through the basics, the focus will be on tap water as the source. In most instances, aquarium hobbyists should find that their local tap water will remain relatively stable over time. But on the off chance that there is a shift in parameters, such as pH or General Hardness, it’s better to know about the shift before the water goes in the tank. Tap water testing helps one know their aquarium water. Another thing hobbyists may like to keep in mind is the importance of checking tap water for sediment. There may be occasions after large rainstorms, or after the water coming into the building has been turned off, or after pipe-work, that sediment finds its way into tap water. If sediment is visible, or if the tap water is a brown-reddish color, hold off putting it into the aquarium until the tap water clears. Be sure to add a good dechlorinator to tap water to remove chlorine before the water goes into the tank. Not only will chlorine be directly harmful to fish, it will destroy the good bacteria in your tank, as further discussed below. As Ammonia levels rise in tank water, nitrifying bacteria grows converting Ammonia into Nitrite. Then another bacteria grows converting Nitrite to Nitrate. 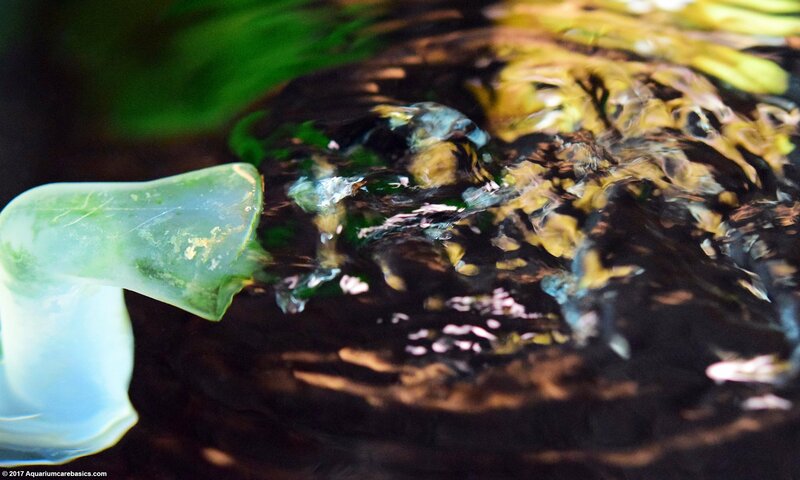 This process is referred to as freshwater aquarium cycling, or the aquarium nitrogen cycle. In freshwater tanks, the end product of aquarium cycling is Nitrate. 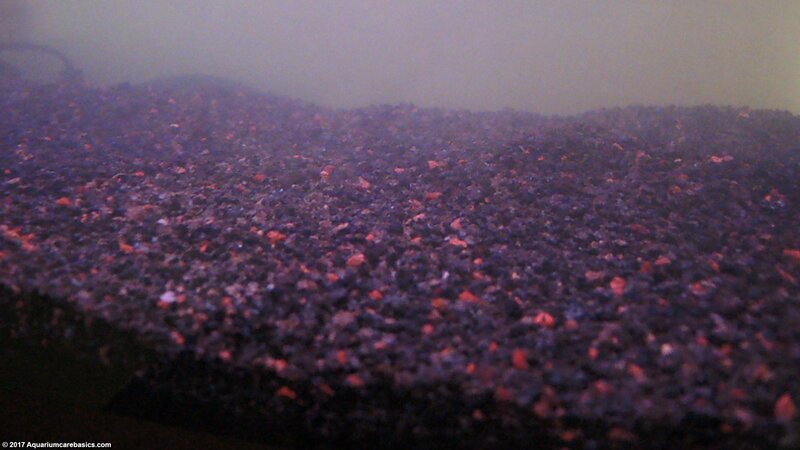 And Nitrate is removed from the tank by partial aquarium water changes. 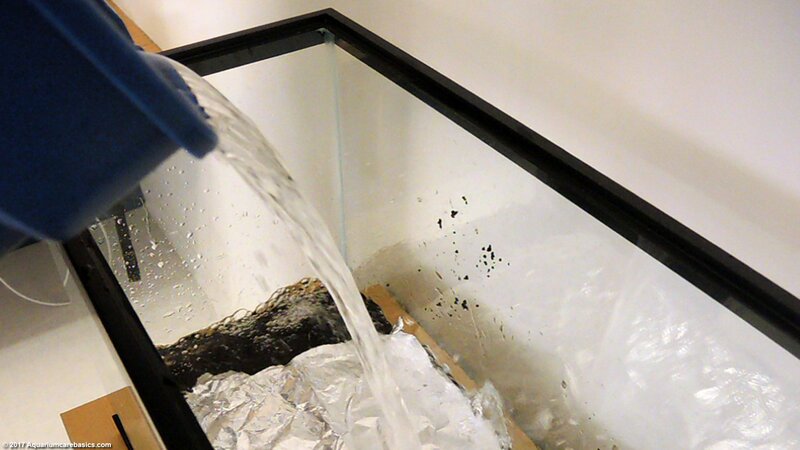 As organic materials such as fish waste accumulate in a tank, aquarium hobbyists may see white cloudy tank water. This cloudiness is caused by a bloom of heterotrophic bacteria feeding on the organic materials in the water. Also during this phase, aquarium hobbyists may see Ammonia levels rise. There may be other causes for cloudy aquarium water, but with newer tanks, white cloudy aquarium water is almost always associated with excess levels of organic waste. Aquarium hobbyists should set up an aquarium water testing schedule testing for Ammonia, Nitrite, Nitrate, pH, Phosphorous and General Hardness. 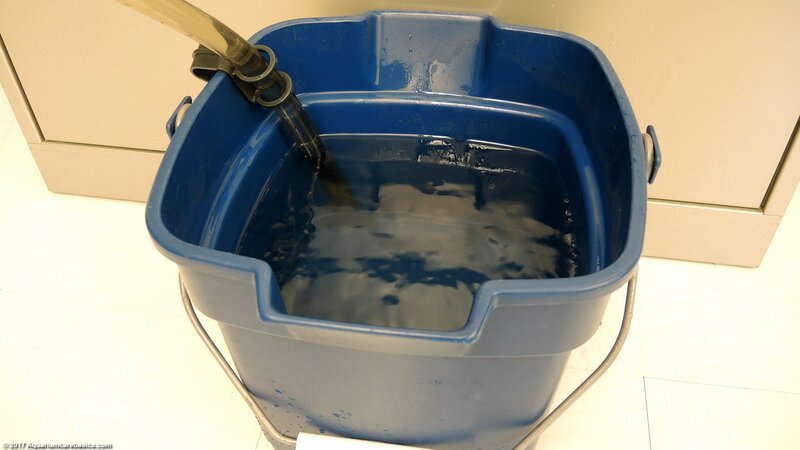 Testing tank water early and often during the aquarium cycling process helps hobbyists understand how the buildup of organic fish waste and Ammonia, Nitrite, Nitrate are related. Also, aquarium water testing is important to monitor for Ammonia poisoning. So after the aquarium cycling process has completed, test aquarium water before and/or after a partial aquarium water change. Many aquarium hobbyists test more often for Ammonia, Nitrite, Nitrate, and pH, and less often for Phosphorous and General Hardness. The point is to establish a schedule and test aquarium water regularly to make sure parameters stay within the proper ranges for the tank. One result of regular partial aquarium water changes is the maintenance of aquarium water buffering capacity, also known as kH or Alkalinity (not to be confused with Alkaline). In non-scientific terms, buffering capacity relates to the ability of water to keep aquarium pH stable over time. Sticking to a water change schedule will take Nitrates out and add fresh water back in. This will help a tank keep its buffering capacity over time. (For a more in-depth look at water chemistry). As a fish tank matures, aquarium water may lose its capacity to maintain healthy parameters. This is commonly referred to as Old Tank Syndrome. Old Tank Syndrome is related to the loss of aquarium water buffering capacity. 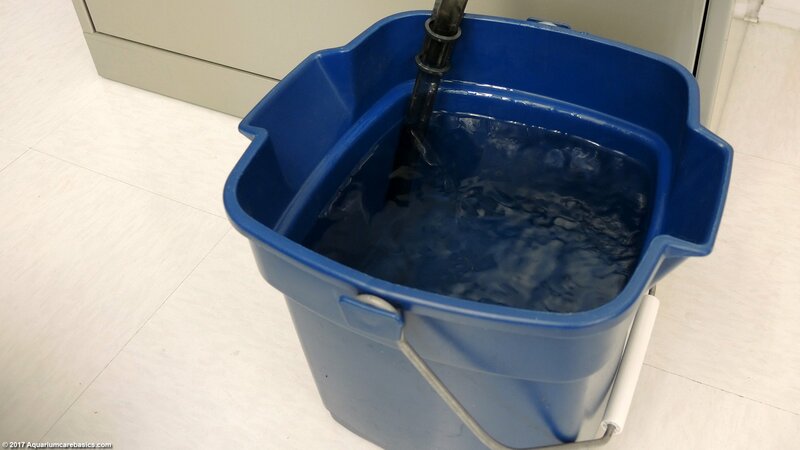 In most instances, there are very few visible signs that water is losing its buffering capacity until its too late, making regular aquarium water testing all the more important. 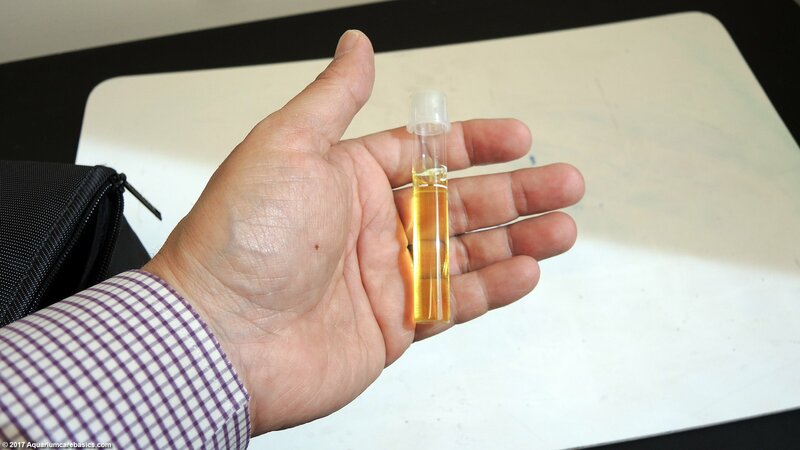 Therefore, water testing will show levels that are different than those that ordinarily exist in the tank.